Firearm deer hunting season began this past weekend, and with it came concerns of Chronic Wasting Disease (CWD). All deer harvested in a 25 county area of the Missouri Department of Conservation’s CWD Management Zone on Nov. 11 and 12 were required to be sampled for CWD at a local testing center. The management zone comprises 41 counties throughout Missouri, including Boone, Callaway and Cooper counties. Chronic Wasting Disease is a neurological disease that causes deer to experience tremors, emaciation and lack of coordination. It is 100 percent fatal with no known treatment. 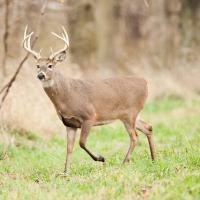 Joe Jerek, a spokesman for the Missouri Department of Conservation, says the disease often spreads when deer are in groups. Since the department began testing for CWD in 2002, more than 76,000 deer have been tested and 42 cases have been confirmed. Jerek says he believes the sampling is vital to Missouri wildlife. While no human cases of CWD have been reported, Jerek says it is important to take the proper precautions. “The CDC strongly recommends that people do not eat deer that test positive for Chronic Wasting Disease, and that they have their deer tested for CWD if they harvested it in an area known to have CWD,” he says. Though testing is no longer mandated, deer harvested in the 41 county disease management zone can still be taken to a sampling center for free testing. Deer harvested in any other area of the state can be taken to either the University of Missouri Veterinarian Medical Diagnostic Laboratory in Columbia or the Springfield Veterinary Diagnostic Lab for a fee. Editor's note: an earlier version of this story stated that all deer killed in the CWD Management Zone were required to be sampled, instead of just deer killed in a 25-county area. We apologize for the error.